Non-contrast-enhanced MR angiography (MRA) of the carotid arteries is often best performed with the three-dimensional (3D) time-of-flight (TOF) . 3D TOF MRA, however, has known limitations including signal loss from slow and in-plane flow, and background signal that may obscure the artery of interest and hinder diagnosis. Although contrast-enhanced examinations may overcome the above limitations of 3D TOF MRA, they carry the risk nephrogenic systemic fibrosis to the patient . Consequently, new methods for non-contrast carotid MRA that produce better image quality than offered by 3D TOF are needed. To report a new sequence for non-contrast 3D MRA of the carotid arteries capable of image quality superior to that of 3D TOF MRA. This study was approved by our hospital's institutional review board. The proposed technique is based on the concept of Signal Targeting with Alternating Radiofrequency (STAR) whereby two image sets are acquired and subtracted to reveal an angiogram . One image set is acquired after a RF pulse is applied to tag blood upstream of the imaged volume, while no tag is used prior to acquiring the second set of images. The proposed 3D STAR sequence, which used a balanced SSFP (bSSFP) image acquisition, was implemented on a 1.5 T Siemens Avanto scanner equipped with a standard head and neck coil. MR imaging was performed in healthy volunteers. Typical imaging parameters for the 3D bSSFP-STAR sequence were: axial or sagittal slab orientation, TR/TE = 3.8/1.9 ms, 90 degree flip angle, GRAPPA factor of 2; 24 cm square field-of-view; 256 × 256 matrix interpolated to 512 × 512; 48–120 0.8-mm-thick slices, 20% slice oversampling, 2.0 sec repetition time, 2–5 min scan time. The tag was a 22.5-cm-thick 180 degree adiabatic inversion pulse applied 900 msec prior to image acquisition. Standard 3D TOF MRA (5 min scan time) was performed for comparison purposes. Electrocardiographic gating was not used for either technique. 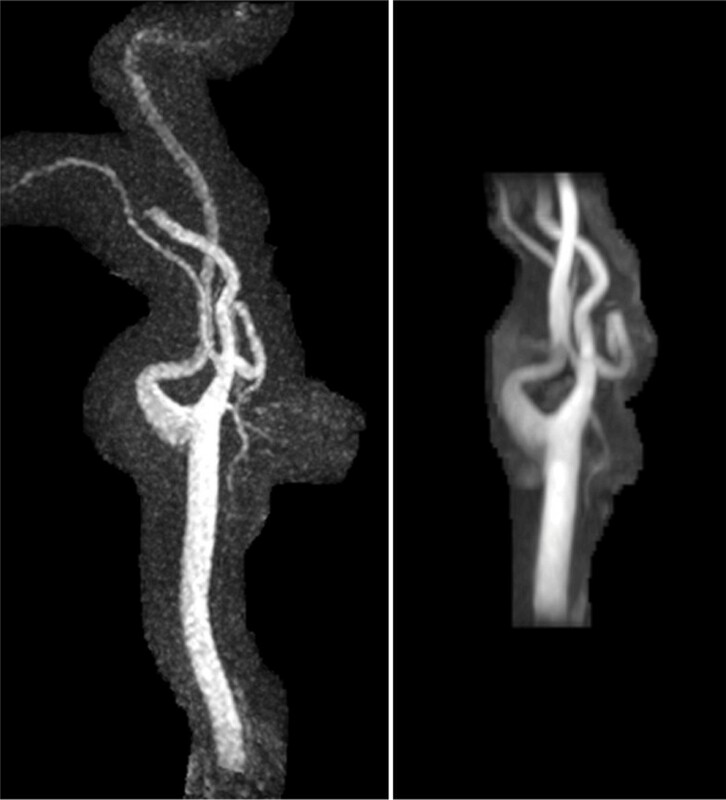 The proposed bSSFP-based STAR technique generated high-quality MR angiograms of the carotid arteries. Figure 1 shows the results of the 3D STAR MR acquisition (2 min 48 sec scan time; isotropic 0.8 mm resolution) acquired in a sagittal-oblique plane (left) in comparison with a standard axial 3D TOF MRA (right) (5 min scan time; 0.8 mm × 0.5 mm × 1.6 mm spatial resolution) in a volunteer. Note the superior image quality of 3D bSSFP-STAR MRA, and in particular, the improved conspicuity of small vessels branching from the external carotid artery. In light of concerns over the safety of gadolinium contrast media, improved methods for non-contrast MRA are needed. We present a new method for non-contrast carotid MRA that yields image quality superior to that of 3D time-of-flight. Compared with 3D TOF, the described 3D bSSFP-STAR technique provides better quality MR angiograms of the carotid arteries in similar or shorter acquisition times. Unlike other methods recently described for non-contrast angiography, synchronization with the electrocardiogram is not necessary. Future work will evaluate the technique's performance in patients.